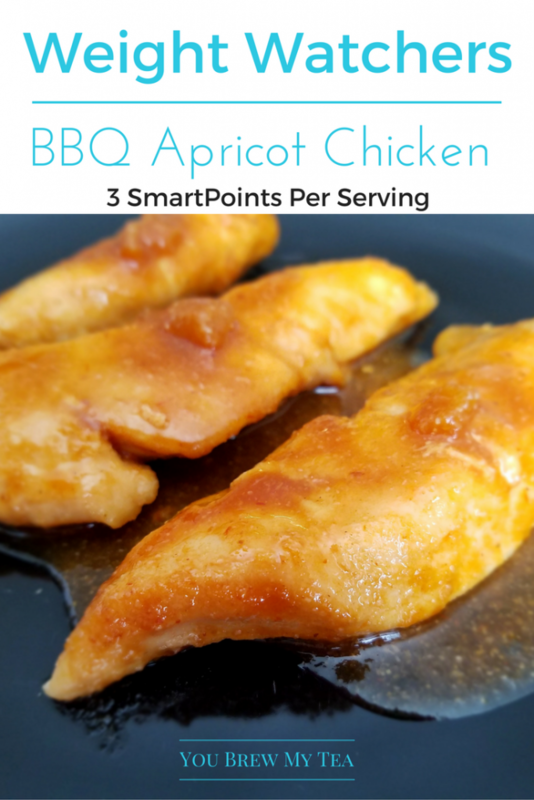 I’ve heard about making an Apricot Chicken Recipe before, but never tried it. Well, in a quest to find something different to serve using our favorite chicken breasts, I decided to update it with some barbecue sauce. The best bonus of this recipe is that it is so Weight Watchers friendly! 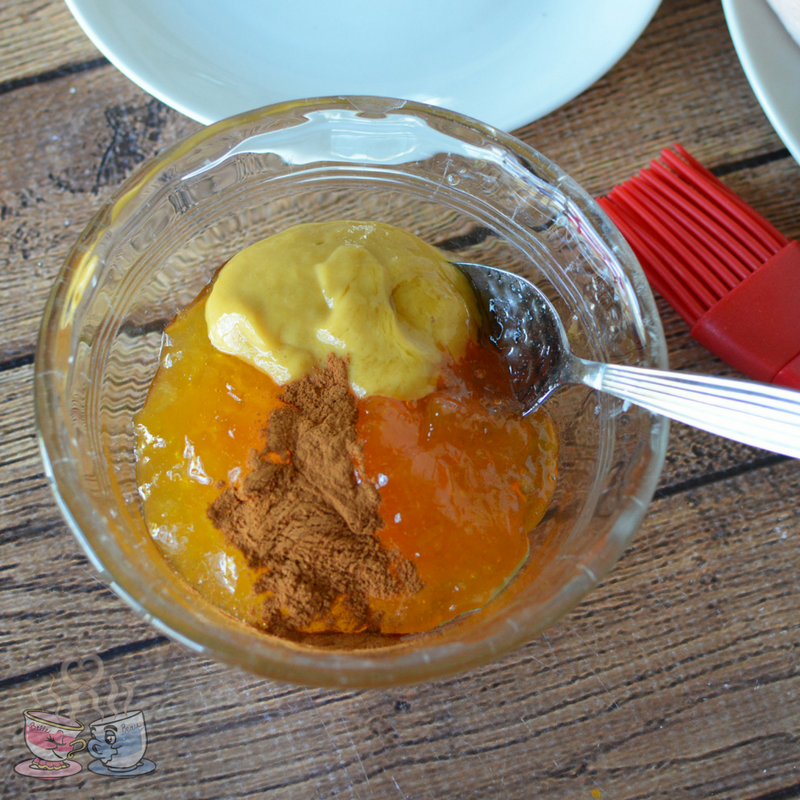 Oh, and super easy to make! 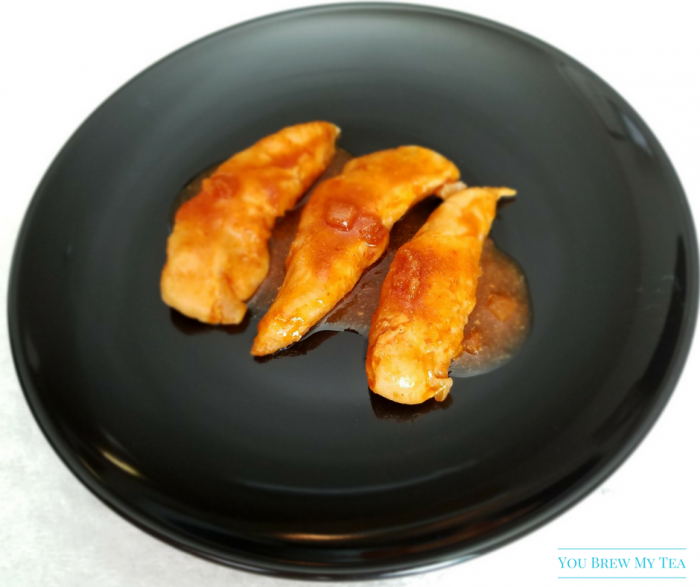 This BBQ Apricot Chicken Recipe is now a new fast and easy favorite option we make at least a few times a month. I swear there is really nothing easier than making this for dinner. When you are struggling to come up with something to eat, this is a rescue meal for sure. It’s just so simple to mix up this sauce, pour over chicken breasts (or thighs) and bake. That’s it. Anyone can manage this recipe! 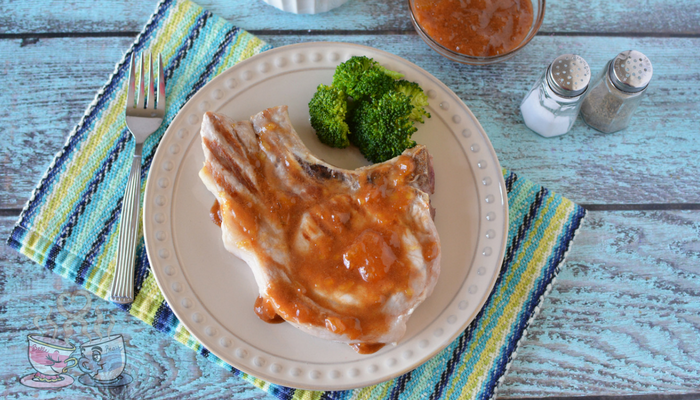 Now, if you are on Weight Watchers, you probably already know how bad barbecue sauce can be. The Beyond The Scale SmartPoints system is all about limiting sugar. So, if you’ve been cooking for long, you’ll know that barbecue sauce is almost 50% sugar. This can be a problem if you really love this recipe. 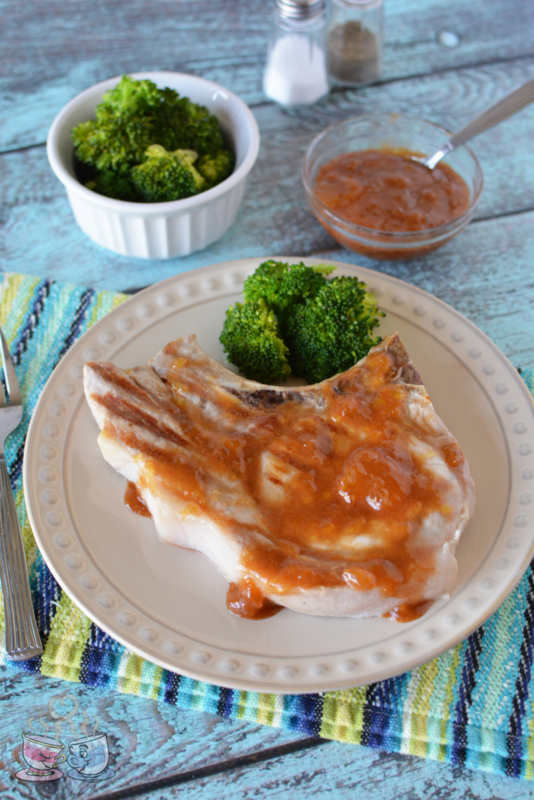 So, there are three great barbecue sauces I love to use that are reduced sugar. Guy Sugar-Free BBQ Sauce, G Hughes Sugar-Free BBQ Sauce, and Simple Girl BBQ Sauce are all available online and in-store, and all help save some of your points. 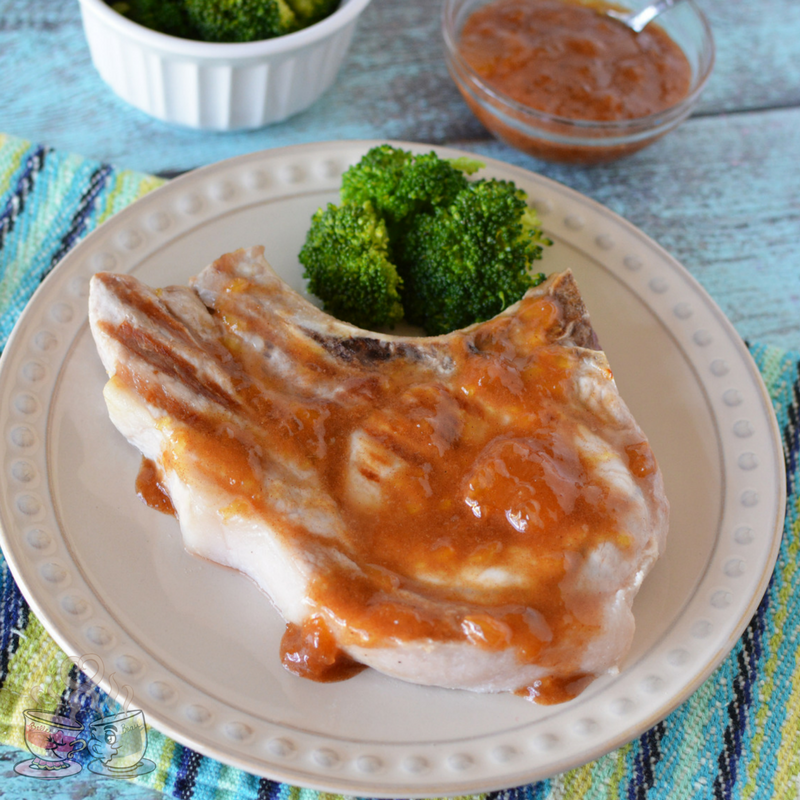 This recipe is calculated using G Hughes Sugar-Free BBQ Sauce found at Walmart. 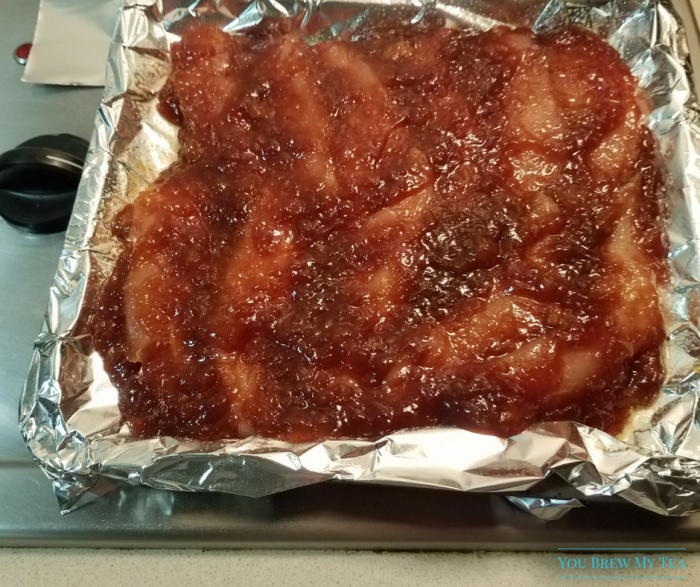 In a medium bowl, whisk together the jam, bbq sauce, soy sauce, and seasonings. Pour barbecue sauce over chicken making sure well covered. Remove from oven, and serve with favorite sides. I use the Weight Watchers Recipe Builder with my Weight Watchers plan to calculate this recipe. I highly recommend using Weight Watchers program. It’s been one of the best investments I have ever made. With accountability, easy to follow food plans, and the fact that I don’t really have to give up anything I like to lose weight, it’s amazing. If you aren’t paying for the monthly plan, you may want to invest in the Weight Watchers SmartPoints Calculator to keep track of your points. Making my apricot chicken recipe just makes dinner time easier to manage. It is easy, versatile, and everyone loves it! I love serving with rice or roasted potatoes and some steamed vegetables. We also have been known to shred and use in tacos or quesadillas! I love Spaghetti, and so I just had to make a Weight Watchers SmartPoints Spaghetti Recipe that was easy, cheap, and delicious. This is not some fancy sauce that takes tons of time or ingredients. This is actually something that anyone can make, and really only takes a few minutes. The key to this is to use ground turkey, lots of extra vegetables, and to choose whole wheat pasta instead of traditional pasta. The result is that anyone can fit spaghetti into their Beyond The Scale program for just 8 SmartPoints per serving! I’ve shared a lot of pasta dishes with you over the years. I love some pasta. I love spaghetti, and especially a good homemade sauce. However, I love, even more, an easy semi-homemade recipe that is healthy and yummy. This recipe uses specific products from Aldi. However, I have compared the nutritional information to the equivalent Target brand Simply Balanced and Kroger brand Simple Truth. All three brands result in the same flavor and points values, so they are easily interchangeable and easy for anyone to recreate. This recipe is semi-homemade because I use a jar of sauce as a base, along with regular pasta. I add in a mix of vegetables, wine, and seasonings to bring more flavor and richness. It creates a meal that imparts tons of flavor and fiber, that makes you a lot more satisfied. That means you are happier, and the points on this meal are definitely reasonable for a full meal. Add in a nice side salad, and you are definitely satisfied. Cook pasta according to package directions. Drain, and set aside. I love using my pasta pot for this, so I can simply lift and drain and not have to juggle a colander and worry about spilling hot water on myself. In a large stockpot, heat olive oil and cook onion, carrot, and celery for 5-7 minutes over medium heat. As they begin to get tender, add in tomatoes and red wine then cook for additional 3-4 minutes. Stir in ground turkey, Italian seasoning, garlic powder, and onion powder. Cook on medium heat for 6-7 minutes stirring occasionally until ground meat is cooked through and no longer pink. Pour in pasta sauce and red wine. Stir mixture until well combined. Simmer over medium heat for 10-15 minutes to allow flavors to develop. Serve over pasta or mix together with pasta and serve. For this recipe, I used the online Weight Watchers recipe developer within the program I pay for. I love that I can input all of the ingredients and instructions and know for sure that my SmartPoints calculations are accurate. I’ve tried a lot of online calculators to get SmartPoints numbers, and frankly, I have found they just aren’t that accurate always. So, while some are close, this gives me the best number and unless I am using the Weight Watchers App or the Weight Watchers SmartPoints Calculator, I know I can trust the website. I never thought I would set out to push Weight Watchers like I do now. I’m not an affiliate for them. I just truly have become a huge fan of the program. It has worked for me like no other program ever has. It is well worth the monthly investment to use the only program. If you’ve ever considered it, take the leap of faith now. It’s worth every dime spent. I have found it so easy to follow and learn more about how to properly feed my body without feeling deprived. 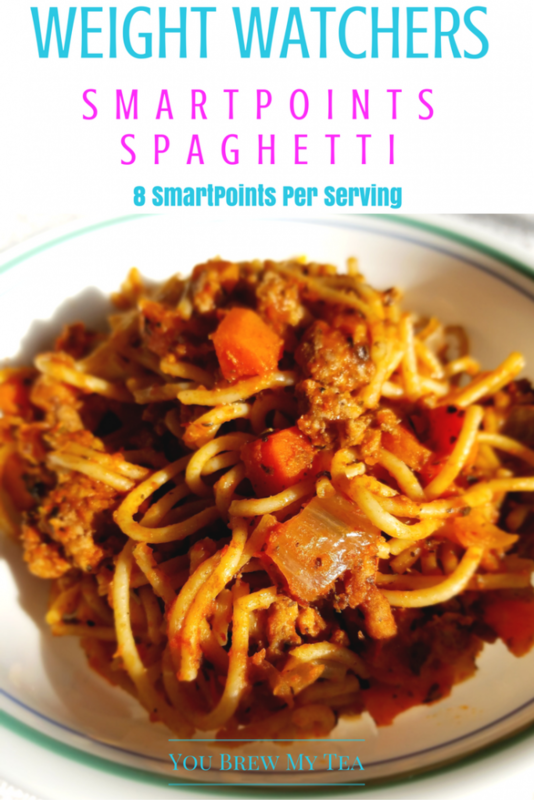 This Weight Watchers SmartPoints Recipe for Spaghetti is a favorite. It really is just another simple spaghetti recipe, but it is amped up with the addition of some red wine for flavor, and added veggies make it more satisfying than simply opening a jar of sauce and a box of pasta. 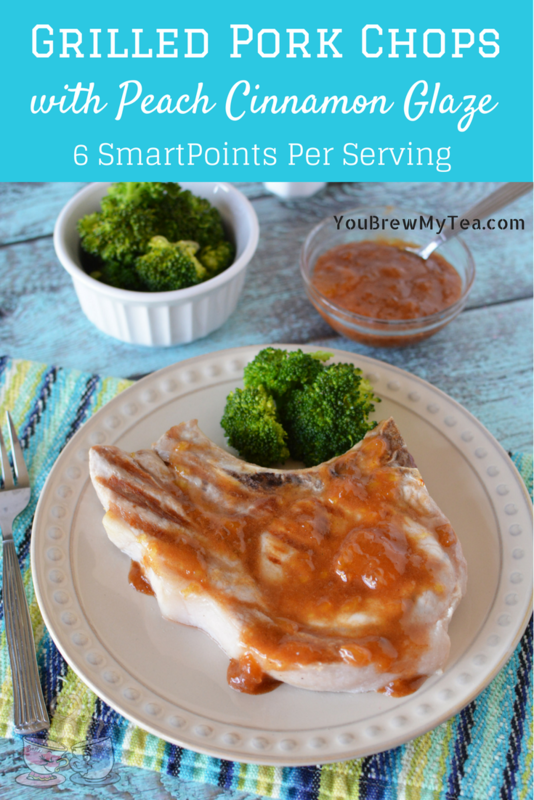 Since you are working to make sure you are satisfied and feel full longer, this is a great option to add to your meal plan. I am always looking for something that we can all enjoy. I don’t like feeling like my menu has to be different from the rest of the family. I do not want to diet. I simply want to make healthier choices. SmartPoints make that easire for me to manage. 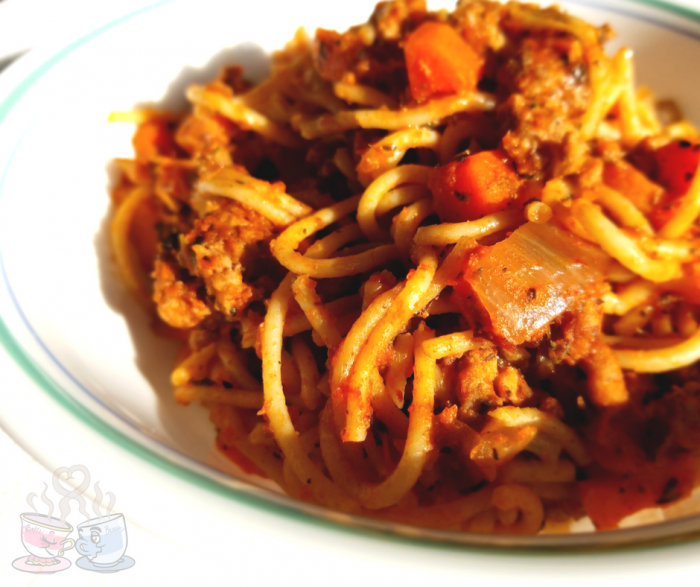 This Weight Watchers SmartPoitns Spaghetti Recipe is perfect. It’s a healthier meal that everyone loves! You see, when my Beau was a kid, this baked mac n’ cheese was a regular Sunday night meal that his mom made. It was one of those things that he didn’t realize came out of having a small budget for food. He thought it was a special meal, but his mom told him it was one of the cheapest things she could make to feed the family. While it isn’t my favorite meal, it is, in fact, that one comfort food my Beau absolutely loves. So, last month, I made a batch for his birthday. The look on his face was priceless. He was grinning from ear to ear. Totally worth it in my book! This is one of those recipes that is definitely semi-homemade. While not my typical recipe to share here, I just can’t resist sharing since it made my Beau, and the Wee Child, so happy. It uses boxed macaroni and cheese, and while he grew up using the classic Kraft version, we used Annie’s Organic macaroni and cheese. If I can make it just a bit healthier, I am definitely going to do so. You can use any hot dog or sausage you prefer. I use Applewood Beef Hot Dogs. I prep my 9×13″ casserole dish with just a little non-stick spray ahead of time. While I want the macaroni to dry out just a bit, I don’t want it to burn. I then prepare the macaroni and cheese according to box directions. You can heat the hot dogs up before you mix them in, or simply slice and toss in as you pour into the casserole dish later. They will heat through in the oven. Don’t be afraid to be generous with the tomato slices on top. One key step, though, is to make sure before you sprinkle with Parmesan, you sprinkle salt and pepper on the tomatoes. This makes a big difference in flavor and just makes those tomatoes pop. As you cook this baked mac n’ cheese, make sure you are watching the top so it doesn’t burn. You want it just nicely browned, and the tops beginning to dry out a bit and create some crisp on the Parmesan and the top layer of pasta. Prepare the casserole dish with nonstick cooking spray. Prepare macaroni and cheese according to box directions. Add salt and pepper to taste. 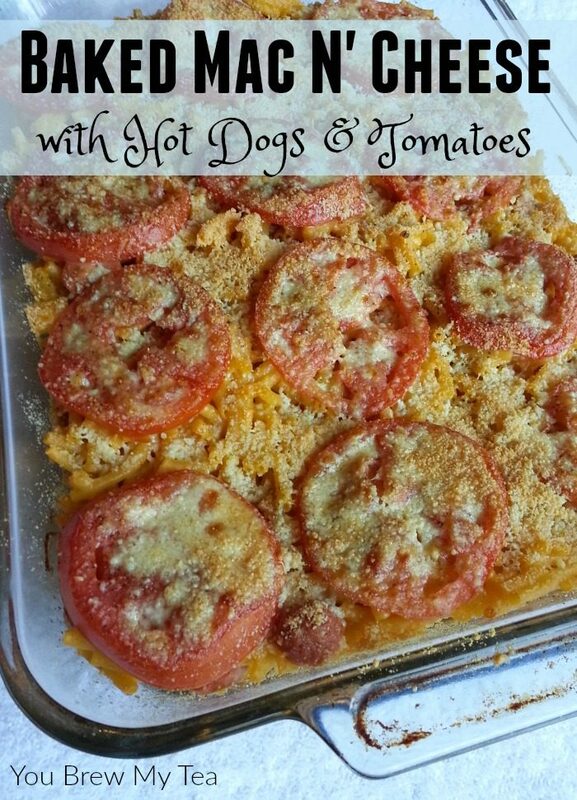 Add sliced hot dogs to macaroni & cheese and stir to mix well. 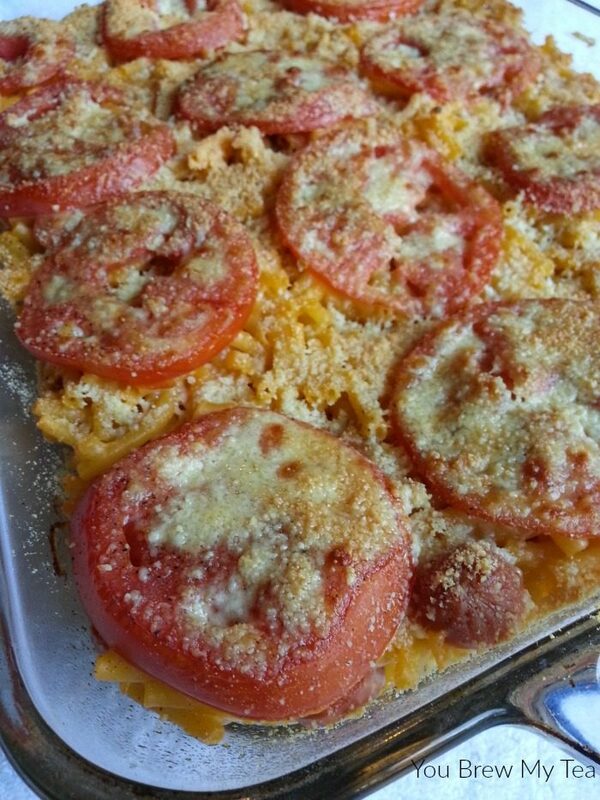 Pour macaroni and cheese into the casserole dish and spread evenly. Top evenly with sliced tomatoes. Sprinkle tomatoes with salt and pepper. Bake at 375 degrees for 17-20 minutes or until browned and bubbly. 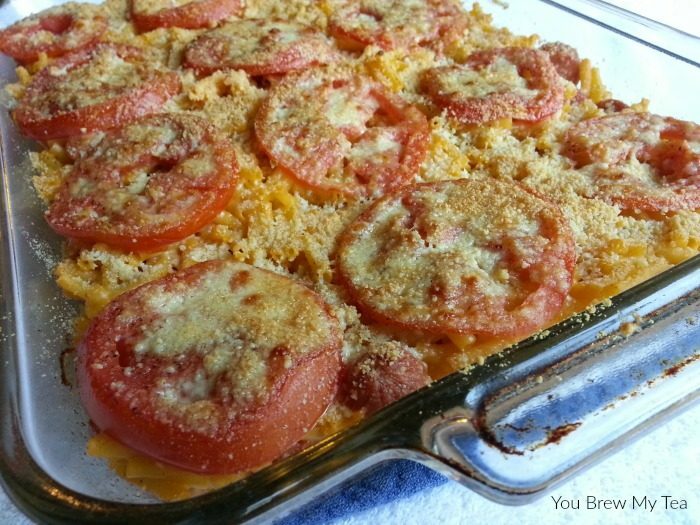 This baked mac n’ cheese recipe is a fun twist on a classic box of macaroni. Your kids will love the addition of hot dogs, and you’ll love how easy it is to prepare. Mix it up a bit with different sausage, hot dogs, or even ground turkey or beef if you prefer. Serve with a side salad or favorite vegetable. I am fairly certain my parents would have been surprised if I had raved over this Unstuffed Cabbage Rolls Soup when I was a kid. Back then, the idea of cabbage anything made me gag. Now days, it is one of my favorite satisfying foods to cook. Not only is it versatile in lots of dishes, but it is cheap. Frankly, healthy and cheap are great in my book, and this soup is a huge hit in our house – even with the Wee Child. This post may contain affiliate links. Purchases made through these links may earn me a small commission. So, I’ll be honest here. When trying to lose weight, I have to limit my carbs. They just tend to slow my loss down. Even on the Weight Watchers Plan. I miss my bread. I miss pasta. I miss all the “good things”. It’s hard for me. I am a very emotional eater. When I am frustrated, depressed, tired, sad – I want to eat. When I am happy and excited – want to eat. Best foods at those times are always the cheesy bread and pasta. So what is a girl to do? Find something healthy that is just as satisfying. 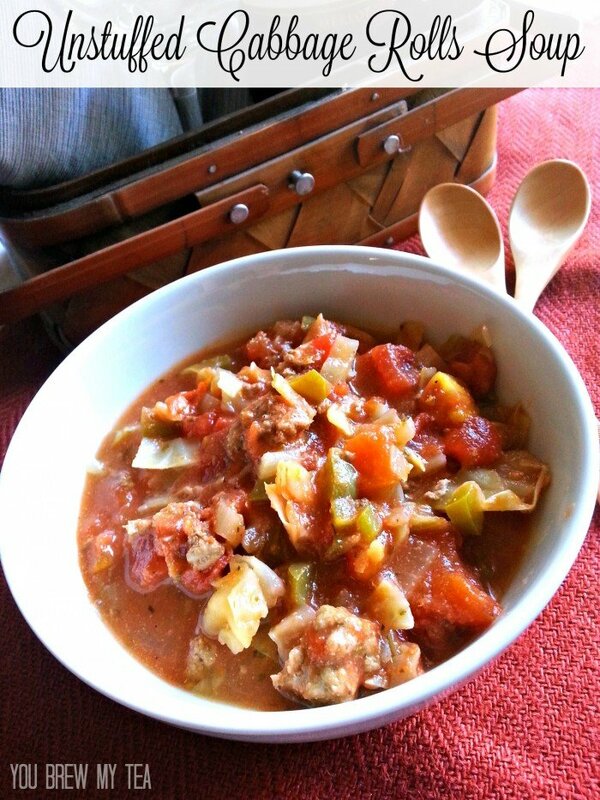 This unstuffed cabbage rolls soup is one of those things for me. It has all the flavors and textures and just makes me feel happy inside. Soup is always a hit in our house anyway, but this one has a rich broth, great textures, and tons of amazing nutrients thanks to the vegetables. Quite frankly, I love it. You can do a couple of different things to make this easier to make. 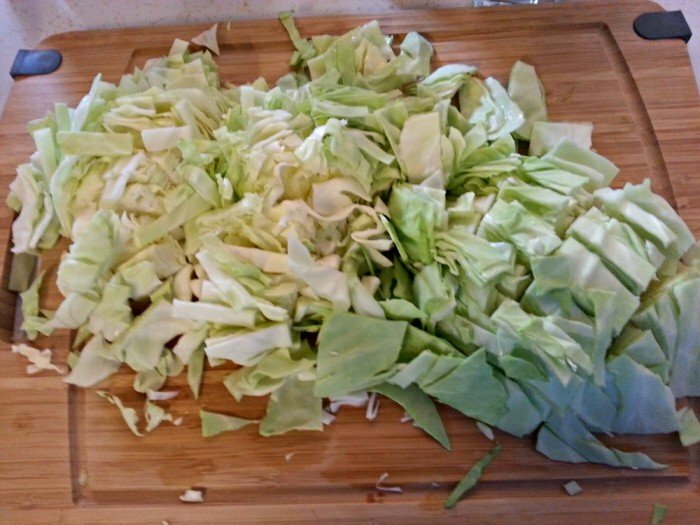 I chopped up my own cabbage, but you can easily grab the already shredded cabbage in the produce section to make things a bit easier. Regardless of what you choose, it’s a simple and fast meal. I start by adding my cabbage, bell pepper, garlic and onion to a large stockpot like my favorite Cuisinart Contour Pot with a bit of olive oil and salt. I cover and let cook down for about 15 minutes. I’ll stir it occasionally, but since cabbage has so much moisture it isn’t a risk of it burning. If you want a bit more flavor, you can cook a bit longer to caramelize the vegetables. I am usually impatient and just want to get to the next step. Now, I am picky about cooking ground meat. I like it to be drained really well before using it in a recipe. So, for this, I cook my ground turkey with some light seasonings in a separate skillet. I usually add about 1/4 of the seasoning blend to the meat as it cooks. The rest of the spices will go directly into the soup. I cook for 7-10 minutes or until it is cooked through. For this recipe, since I know it’s going to cook more, I usually don’t grab the meat thermometer. I just cook until it is no longer pink. I use lean ground turkey, but you can use ground beef or even ground chicken. 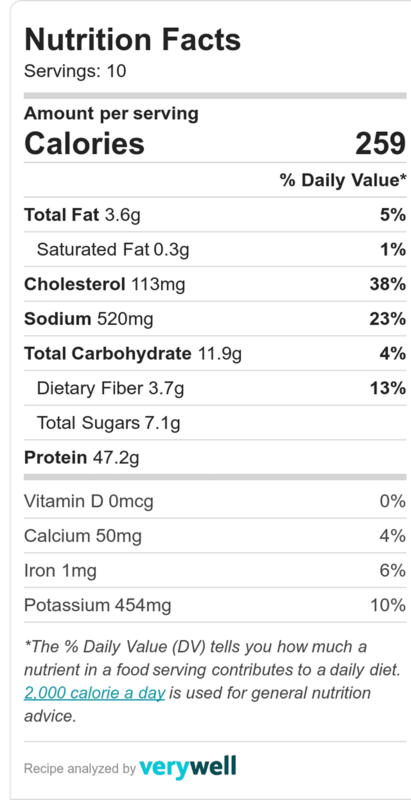 Some even prefer a sausage blend, but you want to consider the added fat if you are watching calories. The next steps are super easy. 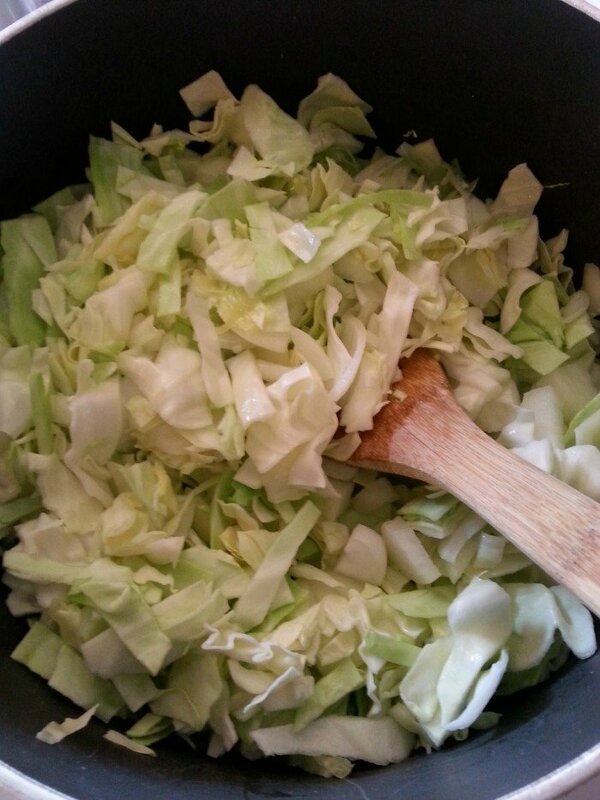 Toss your canned tomatoes, tomato sauce, spices, cooked meat and water into the stockpot with your cabbage and vegetables. Stir well and let simmer over medium heat for about 30 minutes. You can cook for longer if preferred, but that is sufficient to blend the flavors together. In small bowl, mix together garlic powder, onion powder, Italian seasoning, chili powder (if you like a kick), salt and pepper. In medium skillet, cook down ground turkey that has been seasoned with ¼ of seasoning blend. Drain and set aside. In large stockpot, add olive oil, cabbage, onion, minced garlic, and bell pepper. Cook down for 10-15 minutes or until vegetables are tender. 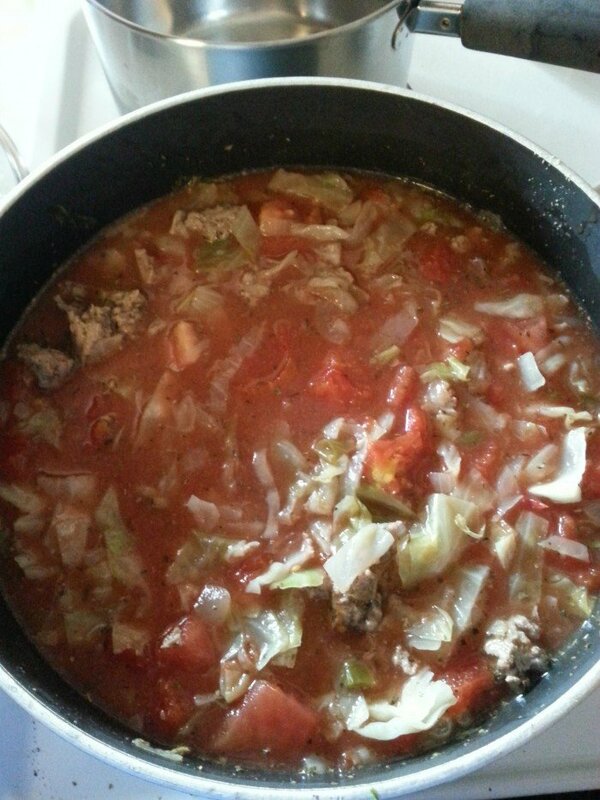 Add ground turkey, tomatoes, tomato sauce, water, and seasonings to the vegetables in the stockpot. Stir well and cook on medium heat for 30 minutes. Stir occasionally. I used the Weight Watchers Recipe Builder within my own paid plan to calculate this recipe. You can also use the Weight Watchers SmartPoints Calculator. 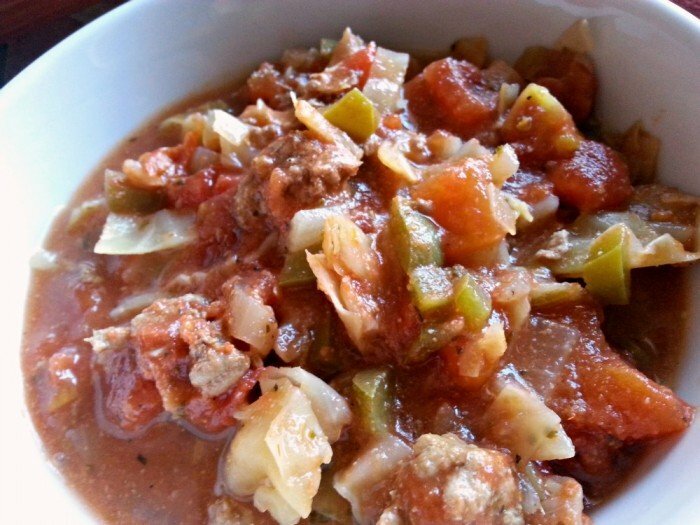 As you can see, this unstuffed cabbage rolls soup recipe is a favorite because it is quick, easy, healthy and delicious. The cabbage really does have a great hearty flavor when cooked down. Some add a bit of rice to the mixture, but since we are going low carb we have always left that out. I believe you could also easily add this to your Crockpot and cook on low for a few hours instead of on the stove top.